I haven't been entering many challenges lately, but my family went to the Paradise Country show, so I had to at least try. Another photo taken with my wife's new IXUS 80, due to laziness in not wanting to bring my SLR along. I know I would have got a better shot with the SLR, as this little camera is horribly slow for action pics, but anyway, here it is. Editing - I have critiqued others in the past against using editing fake DOF into photos, and for using the 'cinema bar' borders. Now I've gone and done both in this photo, and the more I look at the blurred background the worse it looks. Oh well, if I get voted down for it, I deserve it. It's too late at night to keep working on it now. JawnyRico, this one's for you. My prayers go out to your family. Good action shot. I like the composition and the light on the horse and darkened background. Well done. Congratulations on your top ten finish in a toughly competitive challenge. FYI, I didn't suspect the blur was added in PP, but then again I wasn't examining edges closely. Remains one of my challenge favorites. So? Are you going to sell your DSLR? :-) Personally, I like what you did in PP, and it appears by your score and comments that others did as well. Congrats on the 7+ and high placing! Great action shot. Nicely exposed. Great action shot! Lighting and colors are wonderful in this capture - love the sheen on the horse. Great details in this one too. 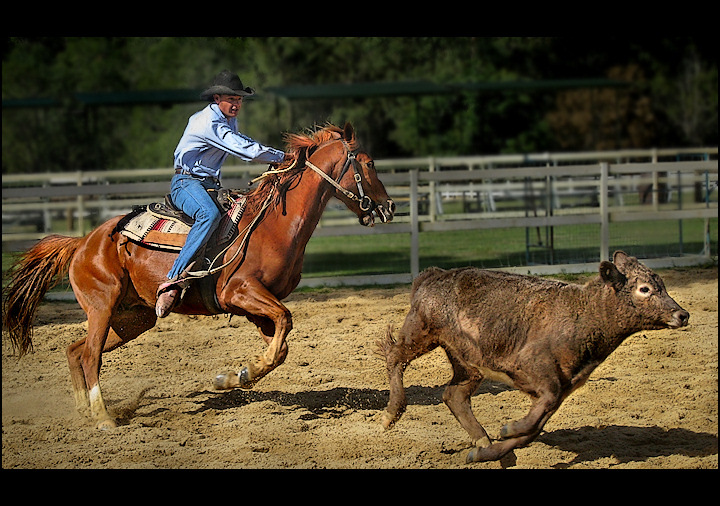 We see the roughness of the calves hide and the flying hairs of the horse's mane as well as the flecks of dirt being thrown up. I also like how you also took the shot that shows the face's and/or facial expressions of all the major characters of this shot - either one or two could have turned such that all we see is the back of the head but here all three either have a full facial view or a side profile. What also makes this a strong action photo is that the scene is not overly busy that the main action & subjects do not get lost in it. This roundup has a visually pleasing backdrop with green trees and green grasslands beyond the fencing. It is relatively uncluttered. The backdrop is in varying degrees out of focus so that it will not distract from the main action going on but rather compliment it. My only critique is that I am not overly fond of the letterbox movie style border on the sides. I think the composition would remain strong without it. This is a beautiful action shot, great color and clarity, good exposure, and fits the theme perfectly without a surfeit of sentiment. Nice action shot, really like the horse's expression here, and the highlights off the horse's coat are spot on. Nice action capture, despite the harsh shadows. True cowboy fashion! Wonderfully caught! Great stopped action. Beautiful colors. Nice DOF. I like that the fence is on a tilt also. Good luck with this. I like the dynamic moment. A fitting tribute to a person so full of life. 9. He-hey! I was waiting for one of these! Great action shot. Sharp, with a good comp and well processed. Good luck. Nice action shot. This is a wonderful capture. A touch tight on the crop, but well done. Fantastic capture. Such sharp focus. Great capture. The edit is clean and they all seem to be popping off the screen. Very nice. Proudly hosted by Sargasso Networks. Current Server Time: 04/19/2019 08:19:01 AM EDT.